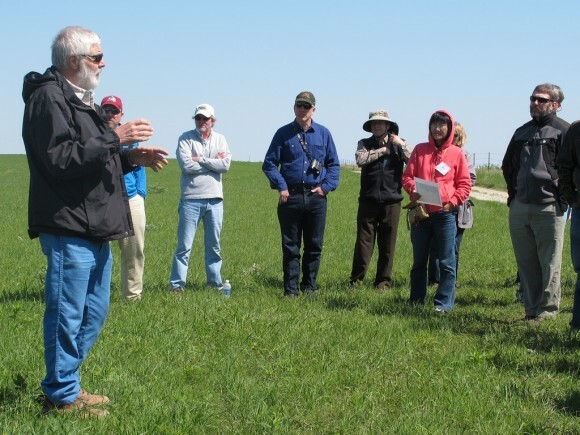 KNZ LTER scientist Don Kaufman discusses consumer responses to fire and grazing treatments during the LTER Science Council meeting field trip to the Konza Prairie Biological Station in May 2014. The 2014 LTER Science Council (SC) meeting was held in Manhattan, Kansas, from May 13-16. You may recall that during the LTER planning process (2004-2007) the governance structure of LTER was adjusted to allow the SC to focus on science rather than LTER business. To date, we have managed to achieve that objective with variable success. This year was different, and we explicitly built synthesis research into the SC program. In the recent past, the theme of the SC meeting was based on the LTER Mini-symposium held earlier in the spring at the National Science Foundation (NSF). This year the Executive Board (EB) decided that a better approach might be to use the SC meeting in a proactive way, to develop priority syntheses topics on LTER research accomplishments and to foster synthesis efforts with the intention that these efforts will drive the theme for the following Mini-symposium. One distinguishing characteristic of the LTER Network is the requirement that sites focus research around the five core areas: (1) patterns and control of primary production, (2) spatial and temporal distribution of populations to represent trophic structure, (3) pattern and control of organic matter accumulation in surface layers and sediments, (4) patterns of inorganic input and movements through soils, groundwater and surface waters, and (5) patterns and frequency of disturbance to the research site. As noted in Callahan (1984: BioScience), “these core research areas were intended to serve as organizing foci for individual long-term projects and to direct attention to areas for productive comparison among projects.” We believe it is now time to re-visit Tom Callahan’s vision for LTER 30 years later, and to focus our synthesis efforts on research related to the five core areas. The theme of the SC meeting, wonderfully organized by Evelyn Gaiser (FCE) and Mary Spivey (CDR) and hosted by the Konza Prairie (KNZ) LTER site, centered on long-term changes in the regulation of primary production (or primary producer community composition). During the meeting, sites were challenged to provide a 3-slide synopsis that addressed the question “What has LTER uniquely revealed about the dynamics and controls on primary production?” The goal was to reveal the ways in which LTER site science is driving the field of ecology forward within the core areas, and to further advance our disciplines by stimulating new focal cross-site activities. If we met this goal, then we would extend this process into all five core areas during future SC meetings. Following a morning of these short, site-based presentations, attendees coalesced into five breakout groups that worked together for the remainder of the meeting. Although the EB and the organizers were cautious about the possibility that this approach might not work, the meeting was wildly successful. Groups focused on topics including asymmetric responses to drought and increased precipitation in terrestrial systems; a cross-site comparison of carbon budgets; relative responsiveness to key drivers of net primary production across sites; productivity dynamics and turnover; etc. Brief summary presentations from the breakout groups can be found at http://intranet2.lternet.edu/content/2014-science-council-npp-working-group-reports. Participants left with a tremendous amount of enthusiasm for what was accomplished, and the groups will continue to flesh out these synthesis efforts, hopefully with support from NSF. Those not able to attend the SC meeting at Konza can still participate in these Network-wide synthesis efforts that should get rolling in Fall 2014. The next Mini-symposium in early 2015 will include results from these synthesis projects, as well as some more site-based presentations to round out the program. In addition to the site-based presentations and cross-site synthesis activities, the SC meeting also included a field trip to the Konza Prairie Biological Station (KPBS), the core site for the KNZ LTER program, and a social at the Flint Hills Discovery Center (FHDC). The field trip began with a brief overview of the KPBS by John Briggs, (Director, KPBS) and an overview of the KNZ program by John Blair, (Principal Investigator, KNZ ). A major focus of KNZ research has been on the interactive effects of fire, grazing and climatic variability, and the 3,487 ha KPBS site includes a series of watersheds with different fire treatments (a range of fire frequencies and fire seasons) and different grazing treatments (ungrazed or grazed by bison or cattle). Because much of the prescribed burning in the region takes place in spring, the group was able to visit watersheds that were vigorously regrowing following fires the previous month, and those that had last been burned anywhere from 1-20 years prior. The differences in community composition and vegetation structure were striking, particularly with respect to woody plant cover that has developed in the absence on frequent fires. The group was also able to observe the impacts of native grazers (Bos bison), and were treated to the antics of one of the new bison calves that ended up on the outside of the perimeter fence that surrounds the 1000 ha bison grazing area. The group also toured plot-level experiments near the KPBS headquarters, including several long-term climate manipulations and grassland restoration studies. Following the field trip and afternoon breakout group activities, there was a reception and mixer/dinner at the FHDC, opened in 2012 as a regional center for education and outreach. The Center features videos and displays focused on the natural and social history of the Flint Hills tallgrass prairie. Because of its close ties to KNZ research, many KNZ LTER scientists serve as consultants in the development of the displays, adding a unique outreach component to the KNZ program. Based on feedback from the meeting participants, the KPBS field trip and FHDC reception were a big success. David Hartnett discussing plant demographic responses to fire and grazing. Science Council meeting participants stop to observe the KNZ bison herd.